What does one do when on holidays? Why they practice their beading of course! I am the kind of person who finds it very difficult to be idle. I can’t simply sit and watch a movie (to the despair of my ever tolerant husband). If one does find me ‘watching’ a movie, I will most likely also be cutting fabric on the floor, stitching on buttons, or have a book of some description in my lap. I NEED to be doing things, plural. So in the absence of my beloved sewing machines, I packed up some precut pattern pieces, beads, sequins, and loaded my Kindle with Beading Basics by Carlita DelCorso and happily set off on holidays with my three little shadows in tow. I did discover that my five year old shadow is somewhat of a thrill seeker, as she braved her first rollercoaster rides and ghost trains at Movie World on the Gold Coast. But that it another story entirely. Big rides are not my cup of tea. Give me a needle and thread any day. And even better if it comes with sequins! This is my second Hannah top. My first one worked out beautifully in some silk crepe de chine. 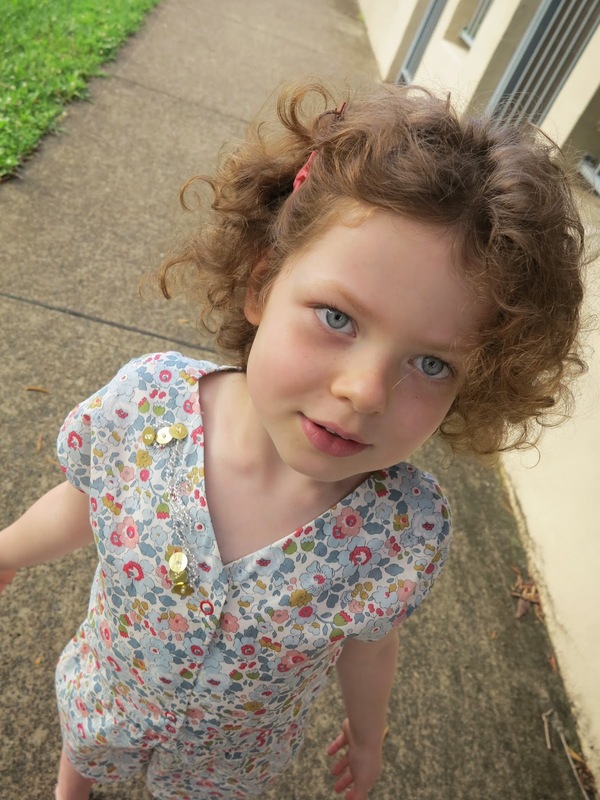 I made this Hannah up in a remnant of simple grey linen that I picked up from Tessuti Fabrics many moons ago. I interfaced the entire front piece, knowing that I was planning to bead it while I was away, but not knowing exactly what I had planned. I also nipped the sides in a fraction and decreased the bust dart a tiny bit. 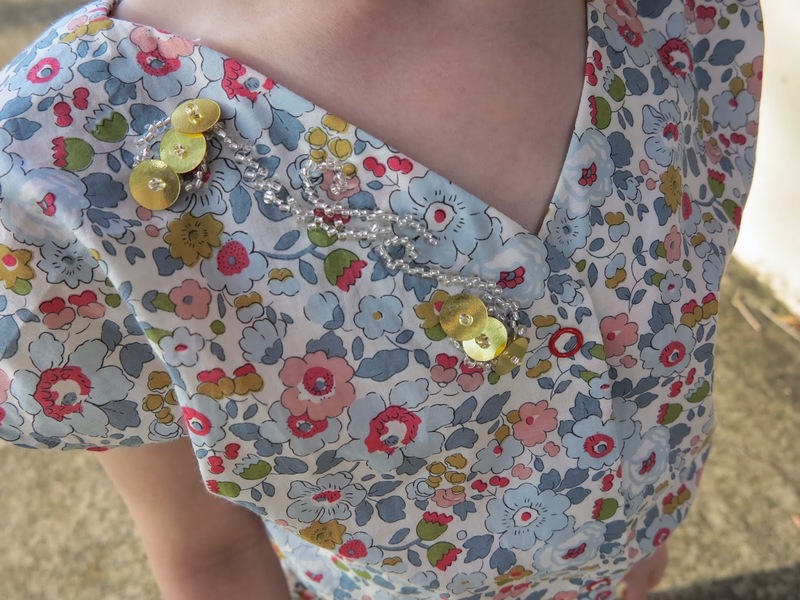 I used a lovely vintage button to fasten the back, from All Buttons. My beading and sequin application was intended to be quite random. I wanted it to look like someone had splattered the front of my top with sparkles and it was just dripping down. Well this was the idea. I actually had no idea just how many beads and sequins such a vision would require, so this was a fabulous learning experiment for me. 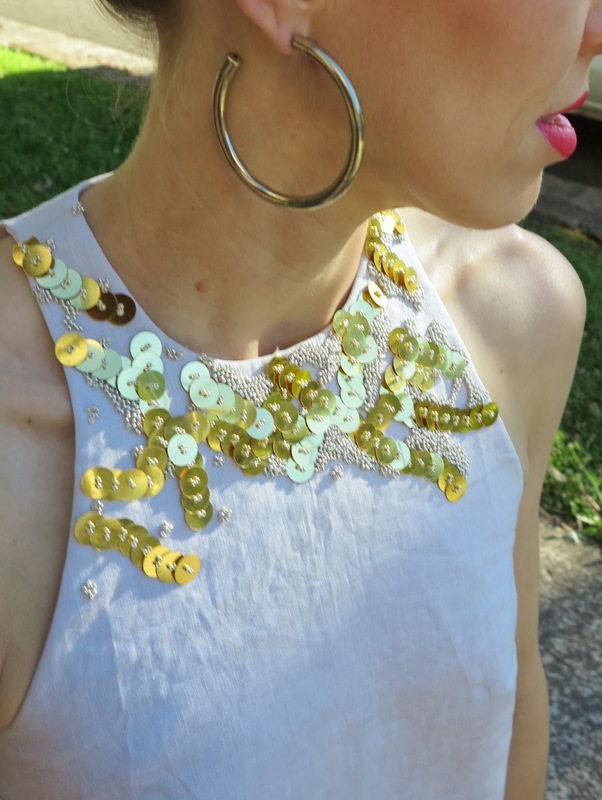 What you can see on my top is about 8hrs of sewing, half a small packet of sequins and 12.5g of seed beads. It really isn’t a lot. I would have kept going down the top with the gorgeous little seed beads but I finished the tube while I was away and by the time I got home, I was just keen to get sewing. I’m pretty happy with the way it turned out. 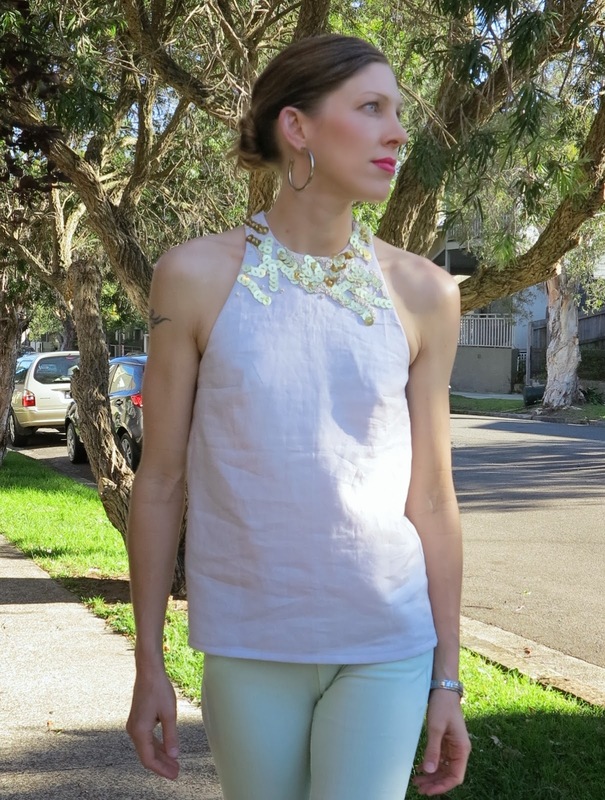 I feel very glam in my sparkly new top and I love how the big gold sequins contrast with the natural crinkliness of the grey linen. I also learnt a lot just by getting in there and sewing on beads, as well as by reading Beading Basics along the way. The book, by the way, is a great simple introduction into sewing beads on fabric. The pictures were a bit average on my Kindle but the content was still good. I would recommend this for anyone, sewers and non-sewers, who might like to embellish clothes in their own wardrobe, or pretty up some of the fabrics they already sew. This entry was posted in Beads, Hannah, linen, sequins, Tessuti Fabrics, top on December 6, 2013 by Debbie Iles. 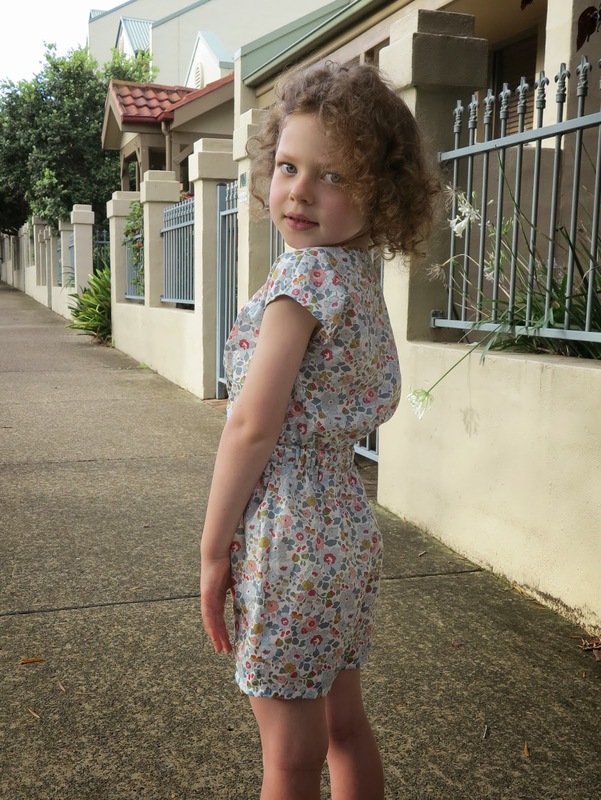 After such a great success sewing my Hannah top, I was quite keen to get stuck into another Salme sewing pattern, in particular the kiddie kimono sleeve playsuit. Well, it turned out an absolute treat! 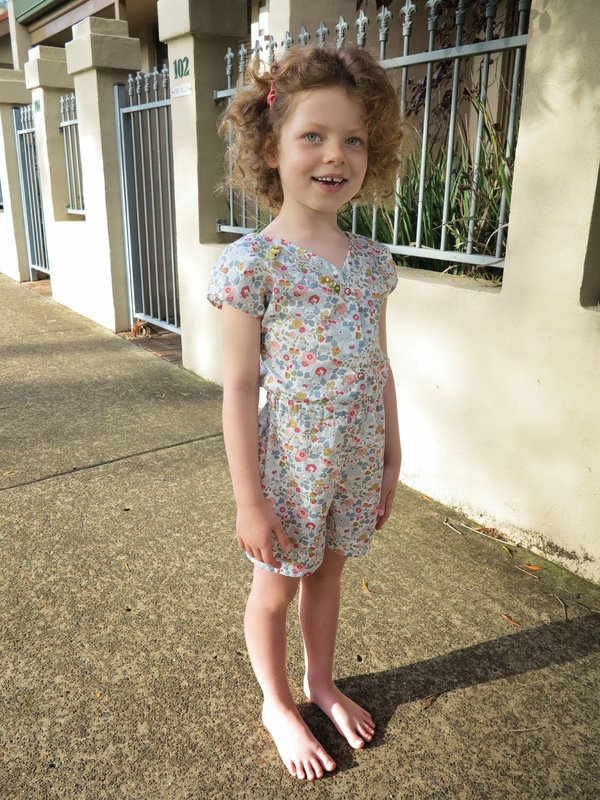 I really think I am developing a soft spot for Salme sewing patterns. The drafting is impeccable. The only complaint I have is that seam allowances aren’t included in the pdf downloads, meaning a bit more time is spent on my hands and knees tracing around the pattern pieces when I would really just prefer to cut and go. 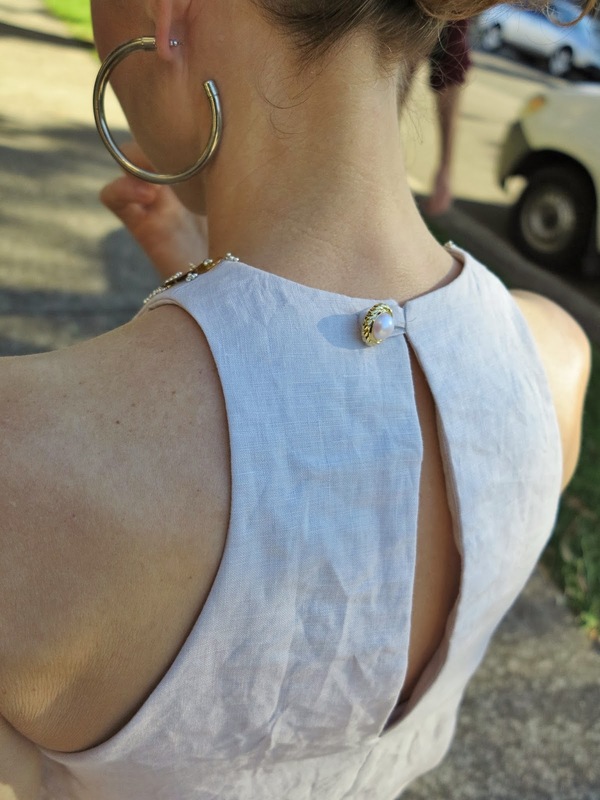 But maybe this feature would come in handy if I decided baste in my seamlines by hand for that extra special project. The gorgeous Liberty of London I used is from Tessuti Fabrics. 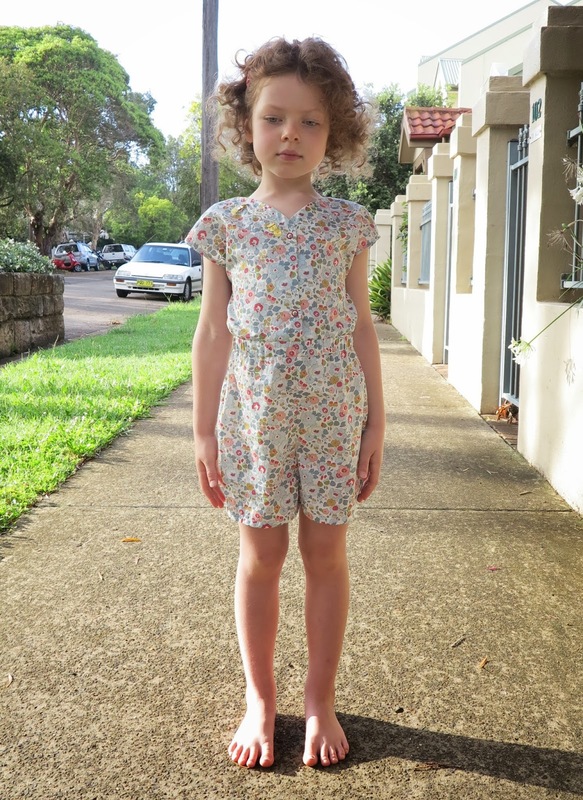 I only needed a mere 70cm to make this playsuit in a size seven for my little Miss 5. She’s quite tall for her age, so I knew I would have to size up in order to get the length right. I would recommend putting three snap fasteners in the front instead of two to prevent gaping. And do you like my first attempt at beading? The fabulous gold sequins came from the Fabric Store. It’s a bit wonky but I am so pleased with myself for finally having a go. I think I will practice a bit more on kiddie clothes before I jump into that special beading project. Thank you Laura Mae from Lilacs and Lace for putting together this little beading tutorial. It has been on my want-to-learn list for positively eons. And I have had a bag of beading stash under my sewing table waiting for me to get started for at least that long too. 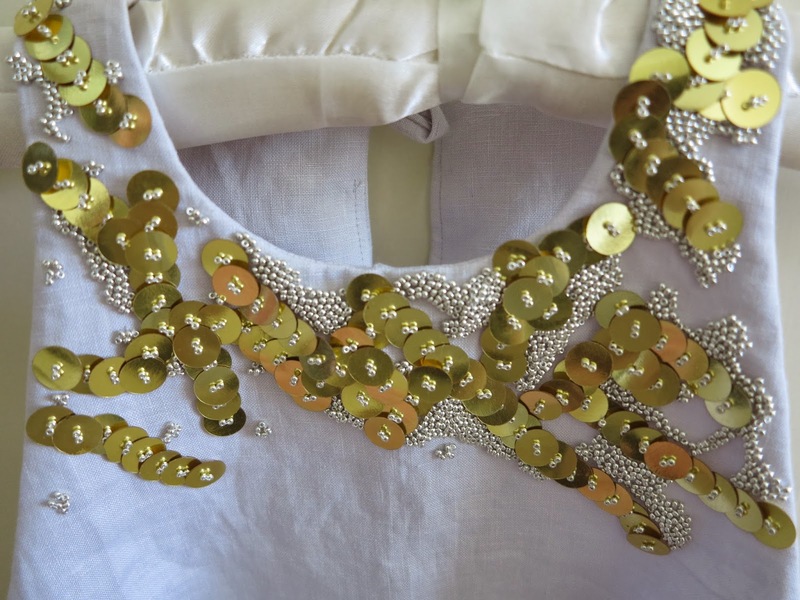 This entry was posted in Beads, cotton, Liberty of London, playsuit, Salme, sequins, Tessuti Fabrics, The Fabric Store on November 24, 2013 by Debbie Iles.